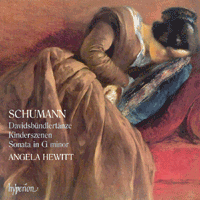 This is the second CD Angela Hewitt has devoted to the solo piano music of Schumann. On it she has included three of her favourite works: the beloved Scenes from Childhood (Kinderszenen) with the ever popular “Träumerei”; the fantastic Davidsbündlertänze which, perhaps more than any other of his compositions, shows his dual personality of Florestan and Eusebius; and the brilliant G minor Sonata Op. 22. Angela Hewitt’s recordings of Schumann’s solo piano works for Hyperion have been described as ‘revelatory … something to cherish’ (Gramophone) and ‘unreservedly superb’ (The Guardian). 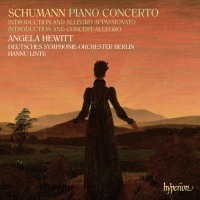 Now she turns her attention to the works for piano and orchestra in a magnificent release which includes the beloved Piano Concerto in A minor—one of the most treasured concertos in the repertoire—and two other works also written for Clara Schumann. Angela Hewitt’s previous forays into the French repertoire have been praised for their ‘tenderness, Gallic wit, verve, and—the most important ingredient of all—charm’. 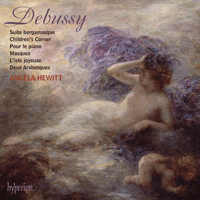 These qualities are very much to the fore in this new disc of Debussy featuring some of the composer’s most sunlit, delightful and popular works. 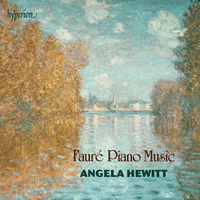 Angela Hewitt’s recordings of French piano music have received the highest critical acclaim. Now she turns to a composer who is more serious and introspective, with a refinement that has led to him being relatively overlooked by performers. But in Angela Hewitt’s hands this music is an utter joy. This album includes the major work Thème et Variations, Op 73—one of Faure’s greatest works for piano—and a selection of Valses-caprices and Nocturnes. It ends with a more radiant piece from Fauré’s youth, the earliest piece included on this recording—the Ballade pour piano seul, Op 19, dedicated to Saint-Saëns. The piano music of Chabrier deserves to be better known. His Dix Pièces Pittoresques were described by Poulence as being “as important for French music as the Preludes of Debussy”. 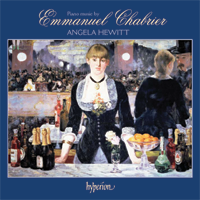 Chabrier’s infectious gaiety is captured on this disc which includes all of his major piano works. Recorded and released in the ‘anniversary year’ of both Handel and Haydn, this CD is an effusive celebration of the two composers, performed by an artist whose renditions of 17th- and 18th-century keyboard works on the piano have received the highest possible acclaim. 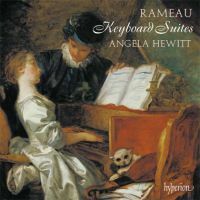 Following in the footsteps of Angela Hewitt’s best-selling Couperin CDs for Hyperion, here is a disc of keyboard pieces by his compatriot, Jean-Philippe Rameau, who was a master dramatist. The E minor Suite contains his well-known “Tambourin”. 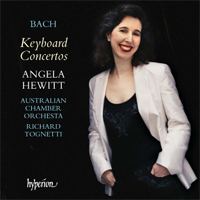 August 2007 sees the start of Angela Hewitt’s Bach World Tour in which she will bring her celebrated performances of The Well-Tempered Clavier to twenty-five countries on six continents. 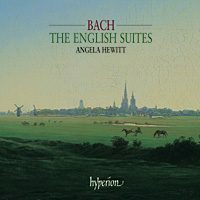 Concurrently, Hyperion is releasing this limited edition box set of Hewitt’s 1998-99 iconic recordings of ‘The 48’ – held by many critics to be the definitive piano version of Bach’s incomparable masterpiece. 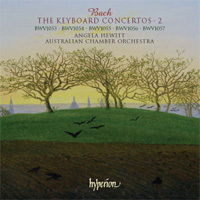 This is a re-issue in slimline double format of the two Bach Keyboard Concertos CDs that were released separately to begin with. Only a few weeks after their release, they were already in the Billboard Charts in the USA, and were named Record of the Month by Gramophone magazine. For those of you who haven’t already purchased the single discs, this is the best format to have! 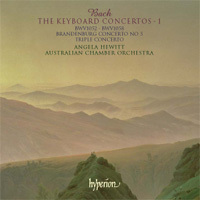 This CD, along with its companion second volume, contain all Bach’s concertos featuring a solo keyboard. The first volume includes the famous D minor Concerto, as well as the Fifth Brandenburg Concerto in D major. This is the second CD in a set that contains all of Bach’s extant concertos for solo keyboard. Four of the concertos are true solo concertos; the one in F major is Bach’s own arrangement of his Brandenburg Concerto No. 4 featuring two solo flutes as well as solo keyboard. 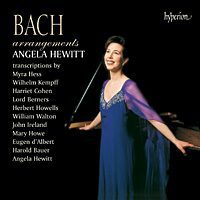 A choice selection of Bach Arrangements by Wilhelm Kempff, Myra Hess, Eugen d’Albert, and many others, including Angela Hewitt herself.